Sush Machida (b. 1973, known as Sush Machida Gaikotsu) is a contemporary Japanese artist. He received his MFA from the University of Nevada, Las Vegas in 2002, and the artist continues to live and work in down town Las Vegas. His work is in the collection of the Frederick R. Weisman Art Foundation, the Portland Art Museum, the Nora Eccles Harrison Museum of Art, the Phoenix Art Museum and the Las Vegas Art Museum. He has exhibited in Tokyo, San Francisco, Los Angeles, New Orleans, Santa Fe and was most recently featured in the museum show, Las Vegas Diaspora. 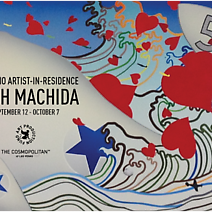 Machida has been featured on National Public Radio, and his work has been reviewed in Flash Art, Art Issues, Art in America, ArtForum, and the Los Angeles Times, among others.